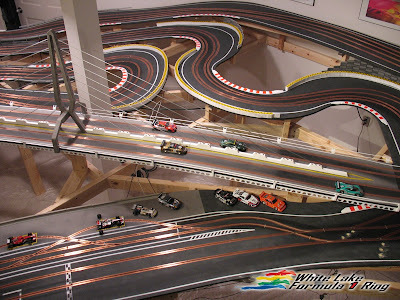 Greetings from the White Lake Formula One Ring. I've been busy juggling form and function the last weeks. I'll get into a little detail here for those that care. I built apex curbing, 20 some sections from 1/8" blue foam sheet. Starting with tracing the lines and transferring that to the foam sheet, then cutout. From there it ways DAYS of filing the directional bevels (Right and Left Handers) and a couple coats of white and fluorescent red paint then glued to the track. 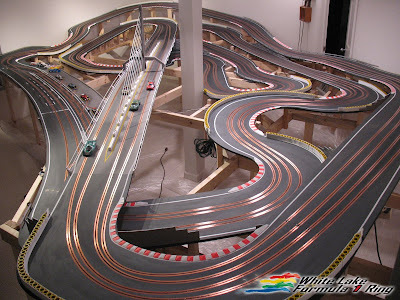 These things are sooo cool, there's a few sections where I have the cars race line hitting the curbing and they perform just like rumble strips. I had to burnish a few down so the cars wouldn't de-slot, but now they are working very well. I think Max Mosley and the FIA would approve, maybe Max can come out and certify it after he stops philandering with prostitutes (If you're an F1 fan you'll have some clue of what that means). Tire barriers were next and after contemplating how I was going to afford 30 thousand scale tires at 5 bucks per four ($37,500) I ran across a thick walled gas piping at Lowes. It's a perfect scale and dirt cheap. Now how am I going to cut 30 thousand scale tires? Anyway I just cut pillars to a scale height of three feet (about 4-5 tires piled up) glued the tire pillars together right on the track. Then I took the tire wall sections outside for paint, dropped the tire wall sections, broke the tire wall sections, reglued the tire wall sections, ah yes and painted the tire wall sections. Back to the road surface where I wrapped them in thin hobby foam which will some day get some track signage. Functionally they're set in the most obvious run-off areas and have already saved Michael Schumacher, Lewis Hamilton and the drunk guy in Martins Jaegermeister Car. My Professor Motor controllers came in about 10 days ago and at first I couldn't get them to work. I tried to sub them right in without Diodes like I had Dave's and zilch. Not working. After some panic calls to theProfessor himself and Dave they both suggested hooking up with diodes and viola! 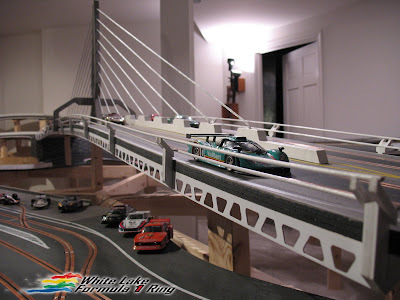 High speed action across all four lanes. Two cars per lane so true AC2car style! Thanks to Andy (The Professor) and Dave for helping me sortout the controller issue. They are fantastic Andy. Ok enough function, lets get back to some form. I made some concrete walls for under the bridge and a few additional areas. These were from the same blue foam as the curbing. I went for a textured checkered pattern and all in all the came out pretty good. Well that's the black and white of it anyway. I Started working on the upper railing for the bridge section. That's all wood dowels, cut and painted and its really sweet seeing the cars speed by through the railings. Some day I'll hook up little LED lights along the railing for some cool night racing. 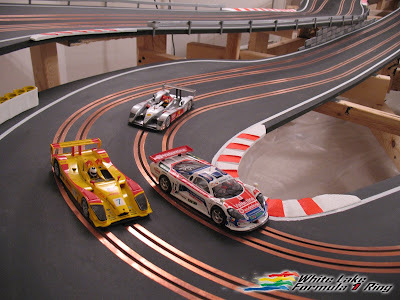 Thanks for all the positive feedback slot car fans! Until the next update.